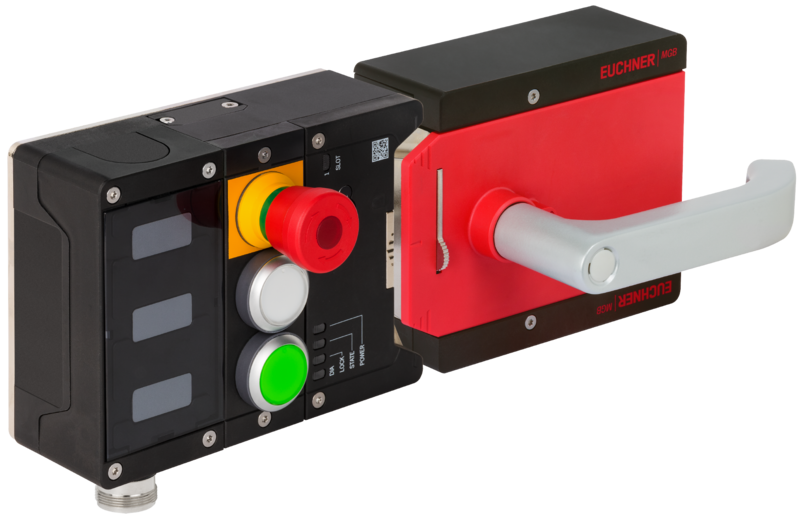 Like the recently introduced MGB2 Modular, the new MGB2 Classic is an enhancement of the globally successful Multifunctional Gate Box MGB from EUCHNER. Unlike the Modular variant, however, the Classic version does not communicate using a bus system. It is instead connected directly to the respective control system, making it the ideal choice for non-networked machines that are wired in parallel. The system features two OSSD outputs, continuously provides diagnostic information via an LED indicator, and can be connected in series with up to ten devices. The modular design of the MGB2 Classic offers maximum flexibility to machine manufacturers, integrators and users. All requirements for door locking systems can be met through combination with numerous freely selectable submodules. Submodules can include pushbuttons, selector switches, key-operated rotary switches or emergency stop buttons, for example. This simplifies warehousing and allows subsequent machine modifications or expansions to be implemented efficiently. A DIP switch additionally contributes to the versatility offered by the MGB2 Classic: Depending on the switch position, the safety outputs are activated as soon as the door is closed but not locked or only when the door is safely locked. Even greater variability is provided by the locking module, which can be fastened on doors hinged on the left or right and on sliding doors. Moreover, the MGB2 Classic can be tailored to its respective task using accessories from the comprehensive EUCHNER range: from enabling switches to escape releases or auxiliary releases. In addition to the robust housing, the extensive diagnostic functions and the submodules’ hot-plugging capability, attention was also paid to the repair friendliness of the components when developing the new member in the MGB2 family. For example, all screws are captive and can be tightened or loosened with just one tool. Furthermore, coded terminals or an RC18 plug connector on the connection modules ensure rapid, trouble-free replacement. This greatly shortens downtimes.